Misspelling can be just an honest mistake or a deliberate attempt to hide something (as when you misspell Jon Stewart as Jon Stuart to keep your YouTube videos from being taken down). On eBay, sellers often too quickly list an item and don't bother checking to see if all the punctuation and grammar is correct. 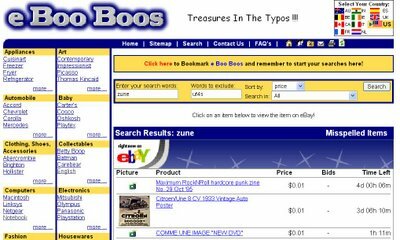 That, plus eBay's horrible search engine can make finding items worth bidding for difficult. 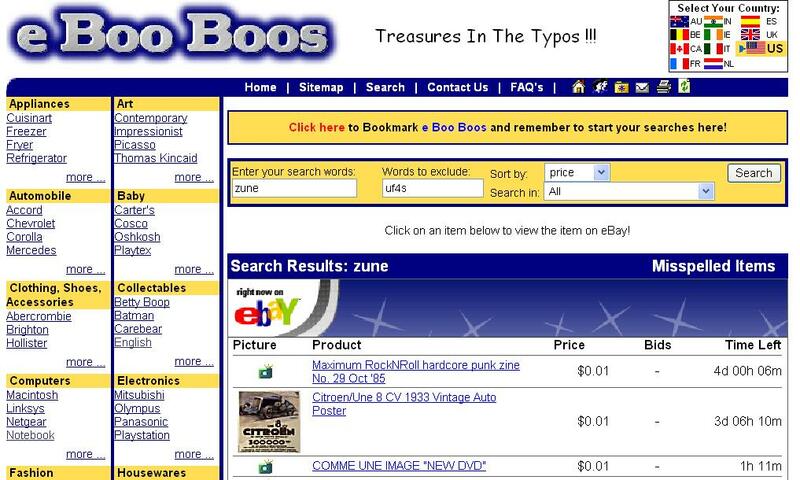 To remedy this, eBooBoos helps you find misspelled auction items. Just type in a correctly spelled item you want, choose a category (optional), and see what's available. It'll try searching for variations of your search terms to cover misspellings. However, the concept is better than the execution. Oftentimes, search results contain a wildly disparate group of items so narrowing by category is a good idea. Depending on what you're searching for, your mileage may vary.